Forman Mills Clothing Factory Warehouse, 3593 Miller Rd., opened its doors July 28. — The empty building left by Burlington Coat Factory in the Genesee Crossing shopping center is now bustling with activity after Forman Mills Clothing Factory Warehouse, 3593 Miller Rd., opened its doors July 28. A crowd of nearly 50 people were waiting when the store opened its doors at 9 a.m., and managers Di Vennon and Amy Collier estimated that 500-550 people had come into the store by 2 p.m. opening day. Forman Mills Clothing Factory Warehouse, which is headquartered in New Jersey, features a wide variety of apparel for the entire family, including urban fashion and designer labels such as Rocawear and Sean John. The store also sells school uniforms, shoes and home fashions like rugs, towels and comforters. The store also offers promotional items, including eight men’s T-shirts for $10 and buy four towels and get one free. “The store is mostly based in deals,” Vennon said. Vennon, who manages a store in New Jersey, said she was brought to Flint Township to help open and train the new store. Once she heads back to New Jersey, Collier will be the main manager. The Flint Township store had been in the planning stages for five to six months. “We plan to have more stores come in the surrounding area, and also one coming in soon to Chicago,” Vennon said. Occupying 55,000-square-feet, Forman Mills Clothing Factory Warehouse employs 167 people, both full-time and part-time. Store hours are 9 a.m.-10 p.m. Monday- Saturday and 10 a.m.-9 p.m. Sunday. To reach the store, call 810-213-7130. 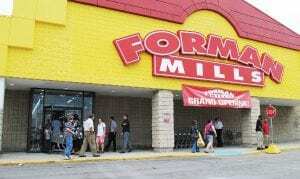 With the addition of the Flint Township store, Forman Mills now has four stores in Michigan: two in Detroit and one in Highland Park. The company was started in 1981 by owner Rick Forman who opened the first Forman Mills Clothing store in Philadelphia. The company has stores in Pennsylvania, New Jersey, Delaware, Maryland, Michigan, New York and Illinois. Fore more information on Forman Mills Clothing Factory, visit www.formanmills.com.